Mustang GT and Cobra models from 1996 to 1998 were among the best of their generation, but car enthusiasts were expecting more power from the engines. Buyers may have been less than thrilled with the new engines at the time, but the past twenty years have given aftermarket designers time to find the best ways to squeeze more power out of these motors. Boosting engine performance enhances the driving experience and is possible through upgrades, replacements, or add-ons. Now, you can easily get the products you need to make your dream Stang setup come true. Anderson Ford Motorsport makes sure of that. Since these engines first came to market, Anderson Ford Motorsport has been testing parts as they've come out to find out what works. We can help you find the right combination to get the performance you want, whether you're looking to build a track car, a dragster, or just something that's more fun to drive on the street. Major improvements can be made without touching the bottom end, and a shared block with the 5.4L truck engine means there's plenty of metal to bore out for more displacement. The new Coyote V8 is based on the Mod motor, making these Mustangs a good starting point for a modern engine swap. 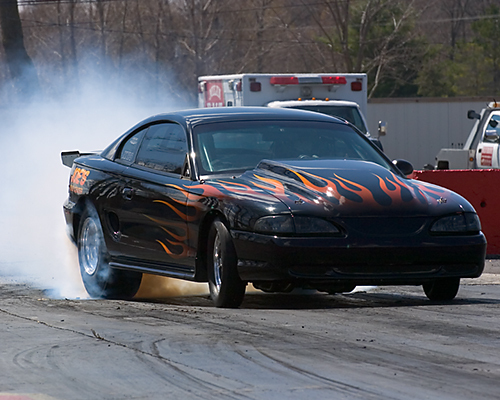 No matter what direction you chose for your build, we have the 96-98 Mustang GT/Cobra parts you need. If you’re looking for intake manifolds, brake kits, exhaust systems, or anything to boost your car’s performance and appearance, you’ve found the right place. You want your car to look great inside and out. You want more torque and horsepower from the engine. What if you can get both? Well, they say the value of a car depends greatly on what’s under the hood, not just the paint color or the accessories. Anderson Ford Motorsport will spoil you with a great selection of quality and affordable parts for your 96-98 Mustang GT or Cobra. Whether you’re doing the upgrades yourself or letting our technicians handle the job, your Stang can get a good combination of charm and power. Choose among the parts featured on this page or browse by category to find the items you need easier. The SN95 Mustangs may have debuted with the old 5.0L, but it was just a matter of time before it was replaced with Ford's new single overhead cam "Mod" motor. Contrary to popular belief, Ford's modular engines get their name from a manufacturing process that allows quick tooling changes so that a production line can rapidly switch between engines, not due to common engine components. The first engine in this family, a SOHC, two valve per cylinder 4.6 liter V8, first reached the market in the 1991 Lincoln Town Car. Over time, the engine family has expanded to include a number of V8s and V10s used in everything from the F150 to the Koenigsegg CCR, which briefly held the title of world's fastest production car. The Mod motor used in the 96-98 Mustang GT is similar to the 4.6 liter used in the Town Car and Crown Victoria. It uses a thick cast iron block with cross bolted main caps. That means it's heavier than the old 5.0L, but that added weight gives it plenty of strength, making it a great starting point for building a high power engine. In these Mustangs, it's rated at 215 hp and 285 lb-ft. of torque, the same numbers quoted for the outgoing 5.0L, but it doesn't have the low end torque of the old small block. The SVT Cobra uses an all-aluminum 4.6l with DOHC four valve heads, a design first used in the Lincoln Mark VIII. It produces 305 hp and 300 lb-ft, nearly matching the output of the race-tuned '95 Cobra R, but without extreme rarity and high price. It uses a split port intake and variable runner length intake manifolds to provide power throughout its RPM range.